The eastern spruce budworm (Choristoneura fumiferana), arguably one of the most damaging forest insects in North America, is a native bug that feasts on the buds and needles of fir and spruce trees causing major damage to Maine’s spruce-fir forests on a regular cycle. Normally populations of this insect are so low that spruce budworms are hard to find however periodically, on cycles of between 30 and 60 years, there is an explosion of the budworm population with the insect becoming so abundant that affected forests suffer serious feeding damage from defoliation severe enough that affected trees produce less wood and indeed many thousands die. Budworm outbreaks are potentially prolonged (5-15 years), but damage can be closely tied to tree species composition. This opens a window onto mitigating economic loss by rescheduling planned harvests to remove vulnerable trees before they are killed, use of insecticides to protect vulnerable trees of high value, and salvage to recover value from dead trees all playing a role. Forest management planning throughout an outbreak can then balance the benefits of these three mitigation measures against their economic and ecological costs, as well as other management objectives. While this is a difficult thing to do, it begins with the knowledge of current forest conditions and risk of damage. Although many forest landowners have this kind of information, others do not, and lack of accessible and consistent spatial information across broader scales, spanning multiple owners, hinders cooperative actions like budworm population monitoring, damage assessment, or collaborative research. To get the big picture of forest conditions needed scientists must turn to satellite derived maps, however mapping a system as heterogeneous and ever changing as a forest is a complex and error prone process, with the methods used to produce maps introducing potentially misleading patterns. With a severe budworm outbreak currently spreading south from Quebec, the need to improve satellite derived maps of forest vulnerability to the insect is of the essence. Now in a collaboration between researchers in the School of Forest Resources at the University of Maine and colleagues in the U Maine Advanced Computing Group, catalyzed by a seed grant from the Northeast Cyberteam Program, research is underway leveraging machine learning techniques to map the evolving state of the forest and provide accurate and up-to-date information on forest conditions, vulnerability, and disturbance or damage. Satellite-derived maps of forest conditions play diverse roles in forestry research and resource management, providing a basis for planning and executing field studies, developing and calibrating models, quantifying ecosystem processes or services, and evaluating environmental change however satellite-derived maps remain non-trivial to either produce or use. To address this, the team from the University of Maine, led by forest remote sensing researcher Kasey Legaard, turned to machine learning, developing techniques that effectively reduce undesirable systematic error when mapping forest attributes from satellite imagery and geospatial data. Machine learning focuses on the development of computer programs that can access data and use it to learn for themselves. Legaard tried a number of established machine learning techniques to map forest conditions, but found that while reducing total error, the algorithms intensified undesirable patterns of error and produced misleading patterns of budworm risk. After some experimentation, Legaard ultimately adapted a multi-objective genetic algorithm to better utilize an extremely flexible and sophisticated set of machine learning models known as support vector machines. The genetic algorithm essentially mimicked natural selection to guide the development of models that reduced both total and systematic error. Outcomes compared well against other mapping approaches. However, as work advanced, the algorithms were found to be extremely computationally demanding, outstripping the computing resources available and restricting the scale of the region that could be mapped. Enter, the Northeast Cyber Team Program. Launched in Spring 2017, the program is a new National Science Foundation funded initiative, which aims to build a regional pool of research computing facilitators (RCFs) to support researchers at small-to-midsized institutions. The program looks to match an undergraduate or graduate student who already has some research computing experience, and the interest to learn more, with a researcher working on a computationally intensive project. If matched, the student is assigned a mentor or mentors, who then work with him or her to provide the research computing assistance the researcher with the computationally intensive project needs. In this case that computationally demanding project was provided by PI Kasey Legaard. Noah Howard, the student participant, is a second year computer science major, especially interested in machine learning. Christian Wilson and Larry Whitsel from the University of Maine’s Advanced Computing Group were his computer science mentors. For this, its first funded project, the Northeast Cyber Team Program enabled the researchers to further develop and grow the reach of software already under development opening up statewide and regional application of their algorithms through enhanced parallelization as well as new approaches that coordinate and accelerate the convergence of GAs. Coupling improvements to their algorithms with more efficient data handling, the collaboration is developing software that will support locally adaptive mapping of forest resources and environmental conditions across increased spatial scales. If you are a researcher at a similar sized institution with a comparably computationally intensive project looking for a helping hand contact Julie Ma for more details about the Northeast Cyber Team Project. 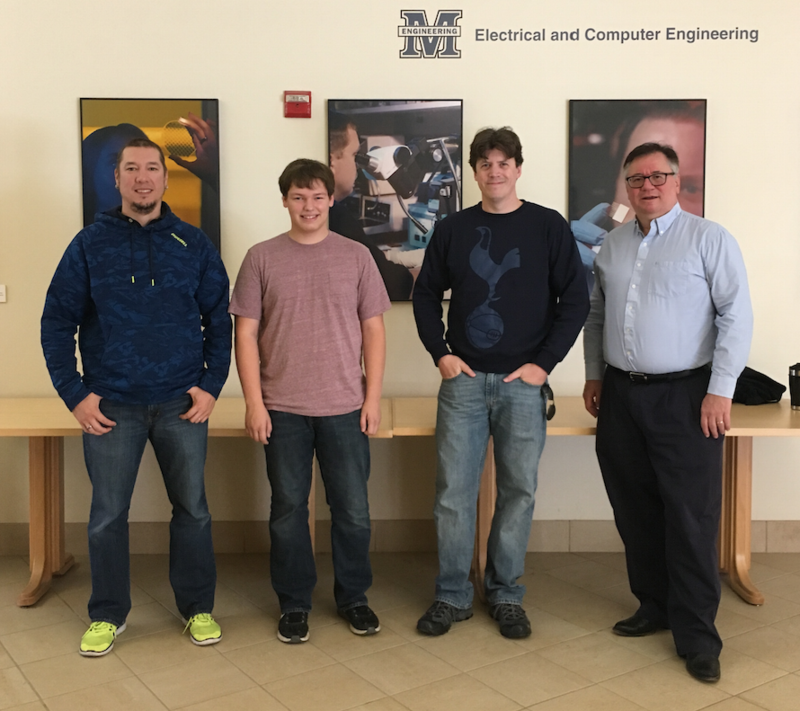 [L to R] Christian Wilson, Noah Howard, Kasey Legaard, Larry Whitsel. Noah Howard, the student participant, is a second year computer science major, especially interested in machine learning. Christian Wilson and Larry Whitsel from the University of Maine’s Advanced Computing Group were his computer science mentors. Kasey Legaard is the project PI – image courtesy the researchers. Kasey Legaard is a PhD candidate in the University of Maine School of Forestry Resources. His interests lie in the evaluation of forest disturbance patterns, trajectories of landscape change, and cumulative effects of forest management practices using remote sensing and landscape simulation models. Legaard’s research includes the development and application of algorithms for digital image analysis, change detection, land cover mapping, and species distribution modeling.